Farming News - Chemical ban will "undermine Scotland’s most iconic crop"
Chemical ban will "undermine Scotland’s most iconic crop"
The mainstay fungicide used to control ramularia leaf spot in barley is to be withdrawn for use in Europe, causing farming leaders to warn of a knock-on impact on the entire Scottish food and drink industry. Malting barley production could be seriously impacted by the withdrawal of the fungicide. The European Standing Committee on Plants, Animals, Food and Feed has voted against renewing the approval of Chlorothalonil after the European Chemicals Agency classed the chemical as a category 1 carcinogen. The agency’s decision followed a similar recommendation by the European Food Standards Agency. No date has been set for a ban on use. Perthshire farmer Ian Sands, chairman of NFU Scotland’s combinable crops committee, called the decision a massive setback for the cereal growing sector and said because the product was crucial for controlling fungal disease in barley, the ruling had the potential to impact the whole food and drink industry. Mr Sands, who owns and contract farms just under 2,000 acres near Balbeggie, said growers would find it hard to understand why a product that has been in use since 1964 has now been classified unsafe. He pointed out that a bad fungal infestation can cause a fall in yield of 0.6 tonnes per hectare, equivalent to more than 10% of the crop. “Ramularia also impairs quality and can increase screenings, hitting those who are growing for a quality market like malt whisky,” he said. “Chlorothalonil is also an important fungicide to protect other crops such as wheat, both by itself and mixed with other products to manage disease resistance, and alternatives are nowhere near as effective. The deputy director of Soil Association Scotland, David Michie, said it was important for farmers to work across the supply chain to find innovative solutions and alternatives to fungicides. “Farmers must be supported and enabled to do this, and be connected with researchers, buyers, and agronomists to figure out a way forward,” he said. Scottish Conservative MP for Gordon, Colin Clark said he had written to Defra to alert government about the seriousness of the issue for Scottish growers. 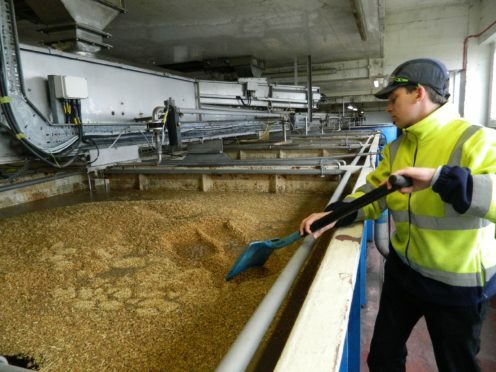 “Having grown barley myself in the wet climate of Scotland, this product was a powerful tool in the arsenal to control fungal disease,” he said.